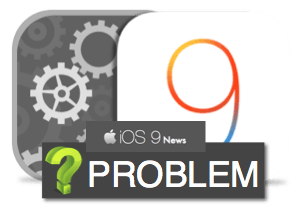 iOS 9 Update Problems｜How to Fix iOS 9/9.2/9.3.4/9.3.5 Bugs & Upgrade Issues? 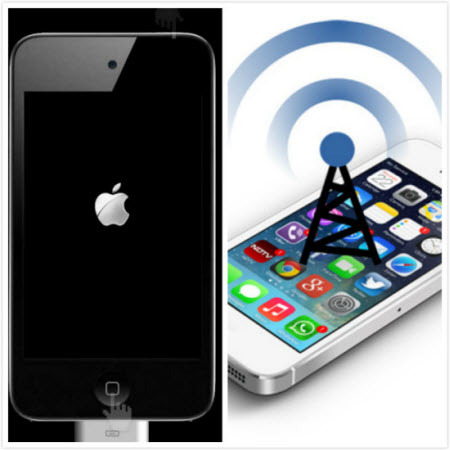 When it comes to Apple iPhone iPad updates, there are a slew of problems you probable meet. Remember the last year's iOS 8 problems? Now I guess you might encounter the similar or even worse problems when updating your iPhone iPad to the iOS 9. Feel frustrated? Don't be, man! Here I will show you the common iOS 9 upgrade issues and the efficient solutions to tackle all the troubles iOS 9 result in. Please pay more attention to these iOS 9 update issues which may similar to iOS 10/11/12 problems. Update: As iOS 12 is available on Sept 17, 2018, many users can't wait to upgrade their iPhone X/8/7/6S/6/SE/5S to iOS 12 for imporved performance, faster speed, and advanced features such as ARKit 2, smarter Siri, group FaceTime and more. But not all is good. It's really frustrated to encounter problems like cannot connect to App Store, WiFi dropping, poor battery etc. Click here to check possible iOS 12 problems and fixes. Your cherished memories are probably the last thing you want to lose in each iOS update. If you don't want to endure any data loss problem in iOS 9 update, go ahead with MacX MediaTrans, which is able to backup and transfer iPhone iPad photos, videos and music to Mac. Probably, iOS 9.3.5 is the final update by Apple before launching the iOS 10 in September alongside its anticipated iPhone 7 (learn more iPhone 7 pros & cons). iOS 9.3.5 fixes security exploit that exposed contacts, texts, calls and emails. Similarly, iOS 9.3.4 fixes a flaw in iOS 9.3.3 discovered by a Chinese jailbreaking team called Pangu. To be specific, this update closed the hole that allowed the jailbreak to work and rendered user's new jailbreak ineffective. The latest iOS 9.3 comes out with a new feature Night Shift, which is designed to automatically adjust the display brightness and colors for your better sleep. If you have already update your iOS 8 to iOS 9.3, you might fall into an embarrassing situation-the automatic Sunrise/Sunset option is not available for your iOS 9.3 iPhone or iPad devices. Actually, it's related to certain countries or regions rather than the bug issue. Below shows you the solution to fix this iOS 9.3 Night Shift issue. Step 2: Tap Privacy and followed by the Location Service. 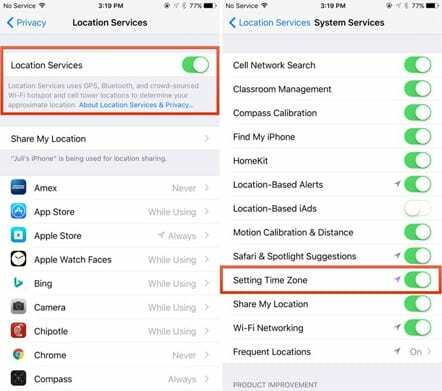 Step 3: Enable the "Setting Time Zone" if it's disabled from System Service. Step 4: Go back to Night Shift settings and the Sunrise/Sunset schedule will be available! 1. Apple's servers are currently under a lot of pressure, just releasing iOS 9.3 official version to millions of iPhones and iPads worldwide, which you know, needs quite a mount of bandwidth. 2. There stands a good chance that some initial bugs in the iOS 9.3 beta version are not found yet so as to affect the iOS 9 offcial version downloading. The specific and clear reasons aren't given right now. Well, you can still have a try on some ways to fix this iOS 9.3 error. Solution 1: try, try and try Again! Solution 2: update iOS 8 to iOS 9 via iTunes, a computer and a USB lightning cable, the traditional yet a little bit troublesome way instead of updating to iOS 9 over-the-air (OTA), for majority of this iOS 9.3 update problem happens on the over-the-air updates. Solution 3: Wait for one day or 2 days to download iOS 9.3 on your iPhone iPad to check if the condition would turn better. 4. Downloading iOS 9 to iPhone iPad, Much More Space Needed! Though Apple officially said that the iOS 9 downloading just occupies your 1.3 GB space in size, it's definitely a thunderclap for certain iPhone iPad users whose iPhone iPad space range from 8GB-16GB, especially for those who doesn't sync to iTunes to store their daily files. Must free up iPhone iPad space? Not really, actually, since iOS 9 has a gift for you. 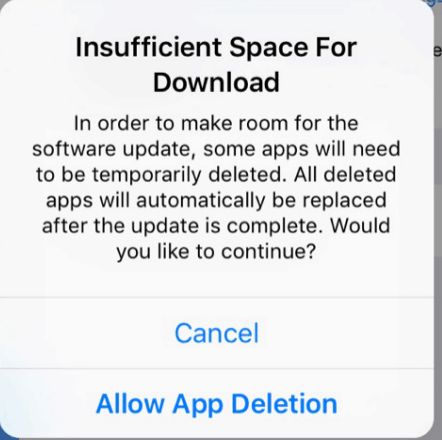 The latest iOS 9 allows you to temporarily delete apps in a bid to successfully download iOS 9. And after iOS 8 to iOS 9 upgrade is over, all deleted apps will be automatically replaced. And if you don't wanna try this method, you can also learn how to free up iPhone iPad space, which is also a good way to guarantee you smooth fix iOS 9.3 space problem as well as iOS 11 update problem. Same as its predecessor iOS 8, the newly iOS 9.3 can't be functioning perfectly without any problems, since the iOS 8 is also constantly updated with iOS 8.1, iOS 8.2 and iOS 8.3 to fix iOS bugs. So it's quite understandable the iOS 9 bugs lead to certain crashes on iPhone apps. And it just needs time for Apple to fix these iOS 9.3 bugs. We have already seen the iOS 8 incompatibility issue with third-party apps such as WhatsApp. So you might not be surprised to see the incompatibility problems between apps and iOS 9, which actually are not the developer's fault and they would endeavor to update their apps for iOS 9. And when Apple eventually releases the iOS 9 public version, the apps developers would update their apps to be compatible with iOS 9 and push to Apple Store. By then, the apps and iOS 9 incompatibility issues would be fixed. Building on the feedbacks of iOS 9.3 iPhone users, they complain that the updated iOS 9 iPhone gets burning hot and the iPhone battery life becomes worse and worse, a surge in power consumption, standby mode costs 25% power. There are dozens of reasons why iPhone battery life is so poor. But the biggest bandit you should know is that the iPhone never enters standby, even with the screen off. So you might do nothing with your iPhone, but it will run off 20%-25% battery from morning to mid-afternoon. Terrible, right? For iPhone users, you ought to learn the basic skills of how to save iPhone battery life. For iPad 2, iPhone 4S users, they would be so delighted to hear that Apple allows them to update to iOS 9. That's quite a good news actually. But don't be so optimistic, since after you update your iPad 2 and iPhone 4S to iOS 9, the operating fluency doesn't get any improvements. They still get stuck as they used to do. Apple iPhone 6/6 Plus and iPhone 5S would not be bothered by this issue? No one survives. 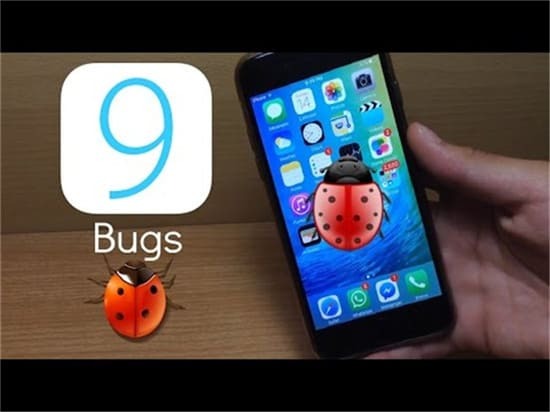 iPhone 6/6+/5S users also distressed themselves about this iOS 9 bug. It's true that iOS 8.3 helped fix some iPhone Wi-Fi problems, but not all are gone. Do you put your hopes on iOS 9.3? Don't expect too much! See, after I update my iPhone to iOS 9.3, I still struggle with Wi-Fi problems. I don't see many enhancements in cellular connectivity and my Wi-fi signal on iOS 9.3 powered iPhone still performs so so and sometimes instability problem also occurs. If your iOS 10 doesn't fix this problem, you can update to iOS 11 to have a try. Customers who have update iOS 9.3 on their older iPhones and iPads are complaining that the updated iOS 9.3 have caused some apps and even the entire system crash. Many users who have update their phone to iOS 9.3 have affected by the iOS 9.3 issues with their apps, or have their device running iOS 9.3 very slow. In fact, Apple users have encountered the similar problems with iOS 8. The suggested solution to those iOS 9 problems is to perform a hard reboot, restore the iPhone or iPad, clean up your old device completely or simple downgrade iOS 9 to iOS 8. There are also users flock to Apple's forum to report that their iPhoen iPad frozen automatically after then press the button Slide to Upgrade. To respond this iOS 9 problem, Apple has released a new page detailing about this issue also with its solution. The process is not complicated and users can follow the several simple steps to solve it with iTunes. For more details about this iOS 9 issue, you may refer to the dedicated Apple support page. 1. Try to reboot is always the first choice. 2. Try to turn on and off your Airplane mode again in the Control Center. 3. Reset your network settings: Settings > General > Reset > Reset Network Settings. 4. Uninstall any problem app and reinstall them again. 5. Downgrade from iOS 9 to iOS 8.4 if you can find the fix. Recently, iOS 9.3 users find that there are constant crashing bugs when they tap the URL on apps. Apple has now confirmed that they are working on a fix for the problem, coming in a software update (presumably iOS 9.3.1). Now, Apple releases the iOS 9.3.1 to fix the tap links crashing on Safari problems. So update your iOS 9.3 to iOS 9.3.1 to solve this problem. Beyond doubt, it would be a cakewalk for you to update your iPhone iPad to from iOS 8.3 to ios 9.3. But the question comes to you when you wanna downgrade your iOS 9 to iOS 8. That's tough, get it? And in fact, Apple warns users that they won't be able to downgrade back to the previous version. Of course, there should be a way to drop back down to iOS 8 but it's a time-consuming process and one that could pose problems and dangers to novice users. It's a pain in the neck. Another iOS 9.3 update problem I mention is for those who are rocking a jailbroken iPhone or if you want to jailbreak your iPhone, stay away from iOS 9.3 for iOS 9.3 will ruin your jailbroken iOS 8 and iOS 9.3 jailbreak hasn't been released yet. Though rumors say that there is someone has figured out how to jailbreak iOS 9.3 device, it still needs time to verify the information reliability and more importantly iOS 9.3 public version debut hasn't yet come. Need to notice you guys that when you update your iPhone iPad to iOS 9.3, you have to keep in mind that the flagship iOS 9 concentrates on security and stability, along with some new features and improvements, but this doesn't mean it can do all well. So be sensible and don't expect too much from iOS 9. After all, what it can do is limited and it's hard for it to accomplish all the tasks perfectly. Hence, think twice before you update. Solution 2 - Make a backup of your iPhone 6/6S/SE/5S/5, iPad Pro, iPad Air 2/Mini 4, iPod Touch 5/6 with iTunes, iCloud or some useful media transfer software like MacX MediaTrans before upgrading iOS 9 to iOS 10. Solution 3 - Upgrade your iOS to iOS 9.3 with final version, which comes to you with new feature and more improvements, like Night Shift (aid you to have a good sleep), improvements to Apple News, Notes, CarPlay and Health. Solution 4 - Ditch away your old iPhone 4S, iPad 2, purchase iPhone SE, iPhone 6S/6S Plus/6/6 Plus, iPad Pro, iPad Mini 4 for better user experience. Solution 5 - Master useful iPhone iPad tips on how to save iPhone battery life, jailbreak your iPhone, etc.